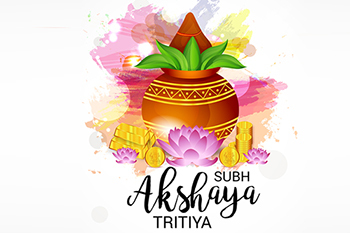 Which form of gold to choose this Akshaya Tritiya? If someone is planning to buy gold, then there are many other options as well apart from physical gold. Indians generally believe that buying gold or jewellery on the day of Akshaya Tritiya is auspicious. Indians buy gold on Akshaya Tritiya irrespective of its price. Gold is also believed to the best hedging instrument against inflation as well as one of the best investment options by Indians. If someone is planning to buy gold, then there are many other options available apart from physical gold. Buying physical gold is easier, but there are many inherent risks associated with it like theft, buying lesser pure gold, etc. One drawback of buying physical gold is that its exchange value is comparatively lesser than new gold. Other options include buying Gold ETFs and Sovereign Gold Bond (SGB). Investing in gold via SGB is much more convenient now. With the Government of India's Sovereign Gold Bonds Scheme, one can earn an assured interest rate eliminating risk of theft and cost of storage. However, in case of physical gold one enjoys the benefit of wearing it in the form of jewellery. By buying SGB, investors can get advantage of both interest income as well as capital appreciation. SGB also has minimum and maximum limits for investments. Another option is to buy Gold exchange traded funds (ETF). Gold ETFs are units representing physical gold. These are in dematerialized form. These units are traded on the exchange like a single stock of any company. ETFs also enjoy the benefit of lesser risk of theft and lower cost of storage (one needs to pay only DMAT charges annually). ETFs have higher liquidity compared to SGBs. Hence, considering the convenience and purpose, investors can buy gold in these forms on the occasion of Akshaya Tritiya.